Demand for Tesla’s energy storage batteries are so high that the company’s Nevada gigafactory could dedicate all of its production to the home and utility products, CEO Elon Musk says. 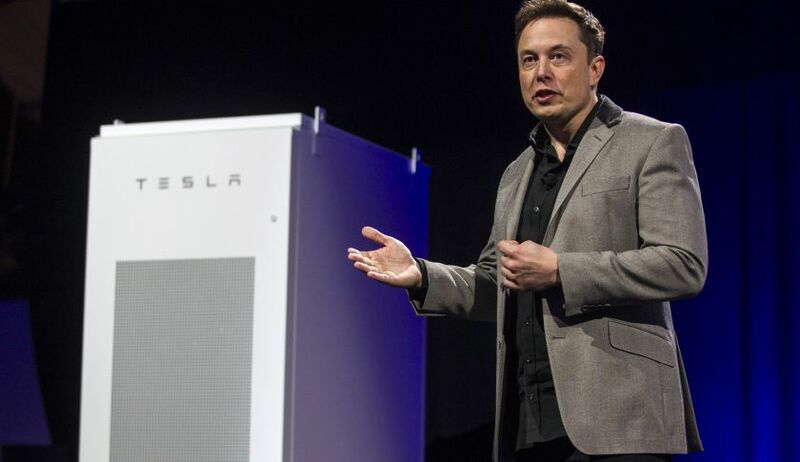 Tesla CEO Elon Musk was his usual effusive self in describing demand for his company’s new Powerwall home batteries for storing home solar energy, unveiled last week at a splashy event outside Los Angeles. He called the 38,000 pre-orders “crazy off the hook” while acknowledging that his company’s production can’t keep up. Musk is making good on his promise to revolutionize the auto industry with his electric carmaking upstart. Now he has set his sights on another target: energy. Musk’s long-term vision for Tesla Energy is bold—he expects global sales and to“fundamentally change the way the world uses energy.” But even he seemed surprised by interest in the energy storage products. The level of demand has been so large the executive team is investigating whether it should boost capacity for stationary storage battery packs at its so-called “gigafactory” currently under construction near Reno, Nev. In addition to home batteries, Tesla has come up with a bigger battery for commercial use and utilities, called Powerpack. Customers have pre-ordered 2,500 of those. Musk cast the demand as a bit deceiving. He described the reservations as the equivalent of 25,000 packs because a typical utility or heavy industrial customer would require at least 10 of the packs. Using a somewhat similar calculation, Tesla expects the average home customer to order 1.5 to 2 of its smaller Powerwall units. If that prediction is correct, that would mean orders for as many as 60,000 Powerwall home battery packs. About one-third of the battery pack production capacity at the gigafactory has been reserved for energy storage. However, Musk said the company could increase that capacity by as much as 50% because of unexpectedly high demand. Even if Tesla does boost capacity, battery packs for the Model S and the highly anticipated Model X SUV are still the priority, Musk added. Powerwall, a sleek suitcase-sized lithium-ion battery designed for homeowners to store energy, comes in 7 kilowatt-hour and 10 kWh sizes. Both units are meant to be combined with solar panels. The 10 kWh home unit is designed as a source of backup power, while 7 kWh-unit can be used daily to extend the environmental and cost benefits of solar after the sun has gone down. The home energy battery, which comes with a 10-year warranty, is designed to be mounted on a wall. Tesla’s selling price to installers is $3,500 for 10 kWh and $3,000 for 7 kWh. The costs don’t include installation or the inverter that converts direct current power to alternating current for use in the home. Deliveries will begin this summer. The Powerpack will be sold in 100 kWh units and can be scaled up into multi gigawatt-hour class. The Powerpacks are priced a $250 a kilowatt-hour. Demand for Powerpack is high, despite the poor economics of its 7 kWh daily cycling unit. Tesla did not break out reservations for the 10 kWh and 7 kWh units. However, the 7 kWh battery does make economic sense in certain markets overseas, particularly in Germany and Australia because of tariffs and the electricity-rate structures in those countries, said Tesla co-founder and Chief Technology Officer JB Straubel. Also on Wednesday, Tesla Motors TSLA -0.08% reported that its first-quarter revenue grew nearly 52% to $939.9 million, over the same period last year. The company also reported that its losses tripled to $154 million in the quarter, or $1.22 per share.